Students, staff, faculty, RAs, TAs, researchers are entitled for library membership. Beside that the library also provides access to people from outside university community through its external membership services. The faculty and staff are required to fill a library membership form and submit it at the circulation desk in the library. The library membership forms are available from library circulation desk as well as from help desk. The LUMS HRD also provides the library related material including the membership form to a newly appointed faculty member. All students registered for the fall semester are automatically given the membership. They will be provided the filled membership forms at the time of their library orientation session. All the students need to verify their particulars and suggest amendments accordingly. For faculty, staff, and students, the Smart Card serves as the library card. To prevent fraudulent use, lost or stolen cards should be reported immediately to library circulation desk or through email at circulation@lums.edu.pk. Your library account will be blocked to prevent misuse of lost card by others. You can activate your account as soon as you get your new Smart Card. 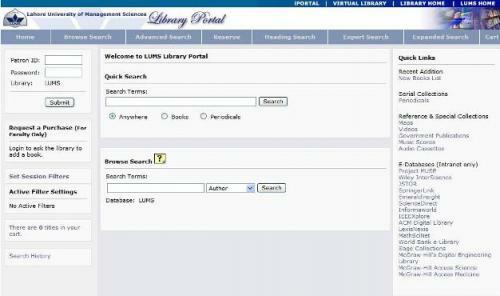 The Gad & Birgit Rausing Library provides you the facility of checking your library account online through library portal http://libraryportal.lums.edu.pk/. While you are log in, you can perform variety of tasks through the library portal to check the items checked out, items overdue, renew books, reserve books and even modify your personal information (login/password) through library portal. You will be required to use your patron ID and password to be able to use the library portal. You can get your patron ID and password from the library circulation desk or email at circulation@lums.edu.pk. Use Quick search, Browse and advance search options to search books and other materials from the library. Write down the call # (location of the book in the library). Retrieve the book from the stack(s). Present your valid Smart Card at the circulation desk along with the book(s). Enter your valid Patron ID and Password to renew your book(s). Click here to see the Gad & Birgit Rausing Library patron ID scheme. If your desired item is checked out by any other member, you can place a hold request so that when this book is returned by the patron, someone else doesnt get this book issued. You will also be notified by a system generated email to pick the item from the library. Most library materials are available for browsing and loans. All members are free to use these materials. However, selected materials are not available for borrowing, and are only restricted for use within the library premises such as thesis & projects, reference materials. Reference material, CD-ROMs, not-to-be-issued copy of course reserve, annual reports, pamphlets, current and bound periodicals, EIP (Economic & Industrial Publications) reports, newspapers, and other non-circulating items cannot be checked-out. Library materials can be returned physically at the circulation desk. A book-drop unit is also placed at the entrance of the library which enables the library patron to return library material while the library is closed. Review Notices: These are sent to remind you due dates of the checked out items so that you can renew those items online or physically at the circulation desk. Overdue Notices: Overdue notices are sent to your email address to remind you that the items have become overdue. Pickup Notices: Pickup notices are sent to let you know that your requested book has been returned in the library and is ready to be picked up. Fine notices: Fines notices are sent to let you know regarding the details of the fines which you have accumulated in your account. In case you change your email address please notify the circulation department so that your email is changed in the system as well. Overdue General Books: Rs.10 per book per day. Rs.50 per item per day. This material is issued for three hours only. if the material is not returned within the allocated time, a fine of Rs.50/- for each hour will be charged. Library has effectively put into practice the fine for those students who violate the library code of conduct for maintaining silence and discipline in the library. Rs. 500 are charged on first time voilation, Rs. 1,000 on second time violation. If a patron continues the violation, the case could be referred to Value & Ethics Committee. Note: System generated over due and fine notices will be sent at patrons' official email account. All library fines are only paid at MCB booth LUMS. Library account will be blocked if the fine exceeds Rs. 5,000/-. Overdue fines will not be charged to Faculty and Staff. In case of loss of library book or any other material the patron will be charged three times the current price of the item plus the processing charges. The patron can also provide a replacement copy to the library. In this case the patron will only be charged for processing charges. If you accrue a fine of over five thousand in your account, your library membership privileges will be automatically blocked by the system. Payment of fines and other library charges is simple. All type of fines can be paid at MCB booth at LUMS. You must present the receipt of the paid fine or charge to the circulation staff in the office adjacent to the circulation section so that your library fines are updated accordingly. If you think the library has made an error or if you have a special situation that made it difficult for you to return or renew materials on time, you may file an appeal. After thorough investigation charges may be upheld, reduced or waived off. Appeals must be filed within three months of billing of any charge. You can send an email at circulation@lums.edu.pk or you can give an application addressing the Chief Librarian in hard format.